I'm too old to do it now...aren´t I? As a guy in my mid-forties, constantly fighting a growing waistline and panicking at every ache or twinge in my body, worried that it might be THE illness that finishes me, I sometimes think that my achievements are all but over. I never wrote my book, although I have written 5 chapters so far and have a great fantasy story for another book, but I will finish them when I get the time!! It all leads me to believe that I still have a lot to do, yet unless my life radically changes they will have to wait until I retire. If I live to be that old, that is. And that´s what worries me, never getting that far and never writing my books. I know they are good, those friends who have read my initial manuscripts tell me they are. But will they ever be finished? Will they ever get published? Regular readers of my blogs (and there are many blogs) also tell me they like my writings...maybe I do have something? So, am I too old now? 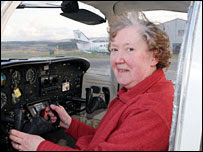 Anne Pool, 65 years, of Inverness, has just obtained her pilots licence. After watching the Red Arrows she decided to take up flying and within 3 years she was awarded her pilot´s licence. Now Anne, if you can do that, I most certainly can write my bloody books (time permitting, as always). Thank you, you are an inspiration. And congratulations!